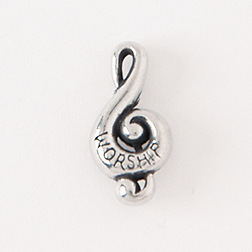 This music lapel pin make a great gift for the worship leader in your life. A simple musical note shows the wearer's dedication to praising God through worship. Our lapel pins are handcrafted from 100% lead-free pewter. 5/8"H x 5/16"W. Made in the U.S.A. Manufacturer: Bob, Siemon Designs Inc.